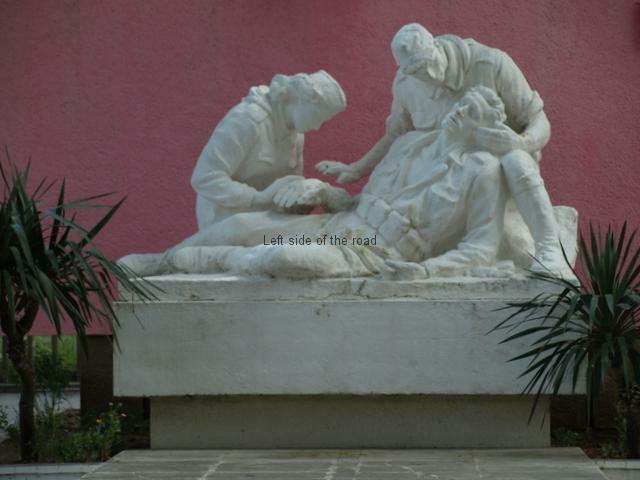 Shoket – Comrades – was one of the early sculptures to be placed in the Martyrs’ Cemeteries throughout Albania, a simple monolith (lapidar) being the most common form of monument. It is the work of Odhise Paskali and was inaugurated in 1964, the same time as the monument to the Permet Congress was unveiled in the main square of the town. The important role of art in the construction of a socialist society has been a matter for discussion since the first writers started to posit the idea that society doesn’t have to be one created for the benefit of a few parasites who decide what should be the fate of the overwhelming majority of the population. However, no real conclusion was arrived at because such a question could not be answered until the concrete conditions existed when a new departure in art could flourish. That only became a practical problem to overcome once the first workers and peasants state was established in the Soviet Union following the October Revolution of 1917. When Lenin started to consider this matter from a position of the workers holding state power, even when the outcome of the Civil War was still uncertain, this was at a time when artistic ‘isms’ abounded, mostly from the ‘left’ but, in the main, the majority of them were transient. This huge melting pot had many causes: the increasing speed of technology; the anger and disillusionment caused by the meaningless slaughter of the 1914-18 war; the search for a meaning in life in an increasingly alienating world; the victory of the proletariat in Russia; the defeats in Hungary and Germany; and a general environment that things didn’t have to be as they always had been. However forward thinking the revolutionary the political ideology of the revolutionaries, first in the Soviet Union, then in the People’s Republic of Albania and later the People’s Republic of China, all those involved had been brought up surrounded by an ideology (economic, political, social, religious, and cultural) that was the antithesis to what they saw as the path into the future. What made the finest of those revolutionaries ‘great’ – at all levels of the Party and society – was their ability to suppress those influences from the past and to create a new set of values for the construction of a society seeking to abolish classes and all that a class based societies entailed. It took some years and not a little experimentation but eventually the form of propaganda to be used in public art was what is now called ‘socialist realism’. It is country specific as to be effective such artistic endeavours have to have a relationship with the history and culture of the different people’s who have attempted the construction of socialism. As with all the other major Marxist-Leninist leaders Hoxha understood, and took on board the consequences of, the famous sentence of Karl Marx from the Preface to a Contribution to the Critique of Political Economy, of 1859. Yes, the building of socialism had to mean the improvement of the material conditions of all the working population and that task began, initially, with the nationalisation of all the land and the means of production which later led to collectivisation and industrialisation of countries that were economically backward. But for socialism to succeed and to move to a higher stage it was the thinking of the people which had to be changed. The ‘old order’ had encouraged and nurtured self-serving selfishness, individuality and a concern primarily for personal survival and enhancement and the aim was to change this mindset to one of considering the common good of all as paramount, working and thinking collectively and considering long terms goals, not only for themselves but for generations to come. All previous social systems have had to address this issue yet it is only when peoples in different countries attempt to move away from class systems and build socialism (with communism being the ultimate goal) that this education and discussion within society is called ‘propaganda’, used in a pejorative sense. If we just take the last two thousand years of world history we have seen the rise (and fall) of slavery, feudalism, capitalism and socialism. Can anyone really argue that capitalism, for example, could have established itself if a sizeable proportion of the population were thinking in the way of slave-owners or actual slaves. Of course not. Their thinking had to adapt as otherwise the ‘new’ social system would simply remain in a rut. If people think that capitalism doesn’t also use public art as a weapon in its cultural battle to maintain its control of people’s minds then all you have to do is study the statues and monuments that are the products of their class war in the UK – but it’s the same in all other countries. On war memorials to those who died in the world wars of the twentieth century the phrase ‘died for King and Country’ is repeated constantly. This is carved in huge letters on the Menin Gate in Ypres, Belgium. Statues to the monarchy are in every major town and city. Statues and memorials of individuals who played a role in the colonialist and imperialist expansion of Britain in the past can be found everywhere, as are statues of individual capitalists as well as those to politicians who ran and controlled the country for the benefit of feudalism and capitalism. A society reinforces its control in many more ways, too many to go into here, but it might be worth citing a recent example in the UK. The newly elected leader of the British Labour Party, Jeremy Corbyn, was criticised for not singing the national anthem at yet another event to ‘commemorate’ a specific date in World War Two (these constant, never-ending commemorations are yet other examples of that constant cultural reinforcement of the capitalist state). So even an atheist Republican it is expected and obliged to play the game – is there a greater indication of a sycophantic and pusillanimous population than its general willingness to sing an anthem that contains the words ‘long to reign over us’? I don’t want to labour the point. I just want to stress that ALL forms of society fight a battle to win the minds of the population, even more so in the early days. The nascent socialist societies were doing nothing different. What was different was that socialism was a society that sought to break completely with the past by doing away with oppression and exploitation of the many for the benefit of the few. That meant that the mountain communists had to climb was much steeper and more difficult than had confronted those ‘progressives’ of the past. This was new ground and hence the difference in approach and also accounts for the hostility that capitalism has had to all such efforts – remembering that this attack on any of the achievements and products of a socialist society are all part of the continual class war. From the very first days of the People’s Republic of Albania the Party placed the development of a new, socialist culture to the fore. The Albanian Film Institute was established in 1945 and this became the Kinostudio Shqipëria e Re (New Albania Film Studio). And throughout the period of socialism Albania produced probably more film footage per head of population than any country in the world. Literature, painting and sculpture were also encouraged as was an imaginative approach to folk-lore and folk culture through music and dance. However, monumental sculpture (or ‘monumental propaganda’ as Ramiz Alia described in an article published in 1968, reprinted in ALS Vol. 1) didn’t seem to play much of a role in the early cultural revolution carried through by the new socialist state. Lapidars and monuments in Martyrs’ Cemeteries were being created but they were simple affairs and it seems there was a trend to construct higher and higher monoliths rather than create sculptures and images to which the people could relate. Interestingly, in the same article mentioned above, Alia commented on the lack of care in the maintenance of those structures that did exist. In fact, prior to the mid-1960s there were few monumental sculptures in the country. The first that I can find in the records is the Monument to The Partisan, in the centre of Tirana, the work of Andrea Mano, which was inaugurated in 1949. (This is in no way a socialist realist statue. It’s the same sort of statue of a soldier that can be found anywhere. It is also not one of my favourite Albanian statues, he looks too angry, but in the wrong way. 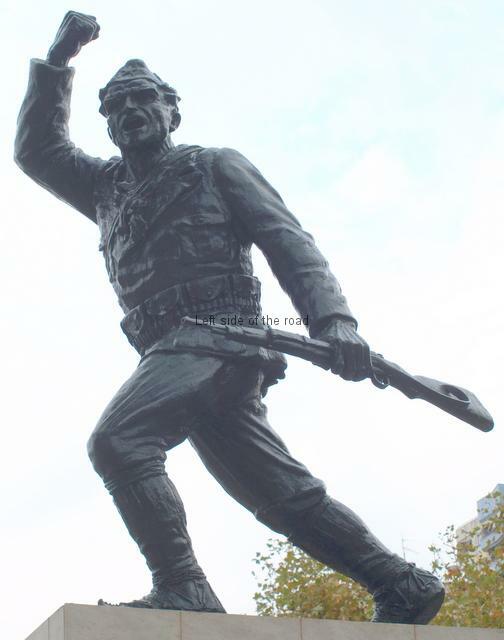 Compare this partisan to the one who stands atop the monument at the sea front in Durres.) The next monuments of note to be erected were ‘Shoket – Comrades’ and ‘Monument to the Permet Congress’, both in Permet and both the work of Odhise Paskali, and the ‘Monument to Agrarian Reform’, the work of Kristaq Rama, in Krutje e Sipërme, unveiled in 1966. The decision to erect the two sculptures in Permet, on the 20th anniversary of the Congress of Permet, indicates that ideas were changing. Thinking in Albania of the role that the construction of ‘monumental propaganda’ could play in the promotion of the socialist ideal seems to have developed much more quickly after the decision was taken, also in 1964, to re-locate the Tirana Martyrs’ Cemetery and to place an iconic and inspirational sculpture in the new location, replacing the simple monolith that stood over the old cemetery in Tirana Park. In a sense this could be considered to be the opening shots of what became recognised as Albania’s Cultural Revolution – with capital letters as this was a conscious and considered attempt to counter old ideas and promote the new, mirroring a similar decision in the People’s Republic of China. In both Albania and China this was prompted by the betrayal of the Soviet Party to the ideas of Marxism-Leninism and the revolution. Over a period of just under 20 years this was to lead to the construction of the many impressive lapidars that are found around the country to this day. One of the reasons there weren’t that many monumental sculptors in the country prior to the late 1960s might be simply due to the fact that the socialist sculptors – meaning by that those artists who had grown up in a society constructing socialism and who had an idea of what the society was attempting to build – simply didn’t exist until that time. A look at the sculptors whose names can be associated with the socialist realist lapidars would seem to support such a proposition. If we just take the case of three of the finest (and most prolific) sculptors during the twenty year period (Kristaq Rama, Shaban Hadëri and Mumtaz Dhrami) they were all born in the late 20s or early 30s and were reaching their artistic maturity at just the right time. They were from a generation who knew what they were being asked to represent in the period of the Cultural Revolution. One of the most prolific sculptors in the country prior to the war let alone prior to national liberation was Odhise Paskali. He produced works which are still to be seen today throughout the country. The earlier works include: The National Fighter in Korçe (1932); The Standard Bearer in Vlore (1932); Çerçiz Topulli in Gjirokaster, (1934); and The Kolonje Martyrs’ in Erseke, (1938) and the bust to Vojo Kushi (1949) in Tirana. However, these are all inspired by Albania’s nationalist struggle of the past. Nonetheless, he did produce important works after liberation. 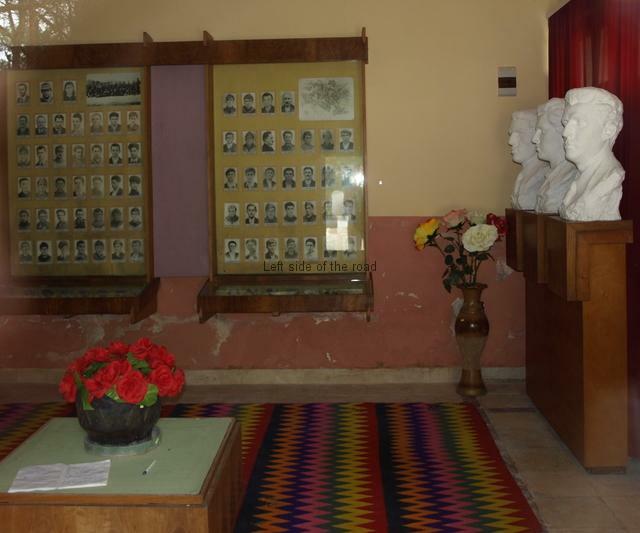 Among these are: a bust of Vojo Kushi in Tirana (1949); Shoket – Comrades and The Partisan in Permet (both 1964); The Partisan Triumphant, the original now at Mauthausen, Austria – with a copy in the Armament Museum in Gjirokaster Castle (1968); The Two Heroines in Gjirokaster (1974); and the most recognisable to visitors to Tirana, the Statue of Skanderberg in the centre of the city (1968). However, these are all conventional, they are well done and some of them are very evocative, but he has not brought a lot new to the idea of public sculpture. The fact that he was honoured by the Albanian state for his contribution to the sculptural heritage of the country doesn’t change that at all. Paskali’s work proves the case that even though works are commissioned and displayed during a period of socialism that doesn’t automatically make them examples of ‘socialist realist’ art. In the same way a piece of art produced before an era of socialism, depicting the struggle of the working class, doesn’t become ‘socialist realist’ after a revolution. This non-socialist realist status is also the fate of those works produced after the socialist state has ceased to be in existence. Perhaps the best term for those particular works would be ‘neo-socialist realist’. ‘Ersatz-socialist realist’ would be the best way to describe the stone bas-reliefs outside one of the private universities in the centre of Tirana, used in a cynical move to attain some after-the-fact credibility. Socialist Realist art has a reason for its existence, other than art for art’s sake. It’s created for a specific purpose, under certain distinctive circumstances and has a special and unique relationship with the people for whom it was created. It commemorates goals already achieved (as in the victory over Fascism and national Liberation), landmarks in the development of the new society (as in the Monument to Agrarian Reform in Krutja) or a declaration of intent (as in ‘Our Land’ in the centre of Lushnje). Now we come to ‘Shoket – Comrades’ in Permet Martyrs’ Cemetery. It’s almost impossible to think that such a monument would have been installed three years later, when the atheist campaign began. The reason it wasn’t removed as part of that campaign, which effectively was in existence until 1990, is a sign of the respect that the Albanian state had for works of art produced during the socialist period which were created to commemorate those who had died in the fight for national liberation – whatever its imagery might imply. To all intents and purposes it’s a religious piece of art. It’s the type of monument you’re more likely to see in a capitalist country where Christianity is nominally the state religion. It’s an image that abounds in many Catholic churches, on canvas, in marble or in stained glass windows. But you won’t find such an image, created in the socialist period, anywhere else in Albania. It’s atypical of Albanian lapidars, it’s unique in its imagery. And that’s important to remember. However, being created in Socialist Albania it’s not just a copy of earlier religious images. There are three figures in this sculpture. A seriously injured fighter is on the ground and has his upper body supported by a male comrade. (The title of this sculpture is sometimes translated as ‘Friends’ but that’s totally inaccurate when dealing with Communist Partisans and the correct translation is ‘Comrades’.) The injured partisan’s shoulder rests against the thigh of his comrade, who is kneeling behind him, and his head is being support by the left hand of his helper. The injured partisan has lost his cap and his shirt is open at the front. They are all in the uniform of the National Liberation Army and we know he is a fighter as there is an ammunition belt around his waist. The male helper is in full uniform, with a star on his cap and has a pistol in a holster attached to his belt on the left hand side. He is bent over and is looking down, sympathetically, onto the face of his fallen comrade, whose eyes are closed. It looks very much as if he is in his death throes. What makes this very different from the Christian myth of the pieta (the name given to those depictions of the moments after Christ had been taken from the cross after his death and he is being mourned by his mother and, sometimes, the Magdalen) is the presence of the rifle that is on the ground between the fallen soldier and his comrade, the top of the barrel of which is just sticking out between the two. The other figure is a female partisan. She is also in uniform, wearing a cap with a star at the front but there’s nothing to indicate she’s armed. (I’m not aware if there was a specifically devoted corps of medics in the Albanian partisan army.) She holds the right hand of the fallen partisan in her own right and seems to be looking for a pulse with her left. However the composition seems to indicate that this is futile, that they are too late to be able to help him. The injured’s left arm rests on the ground with the hand loosely open as if all life has gone out of the body. 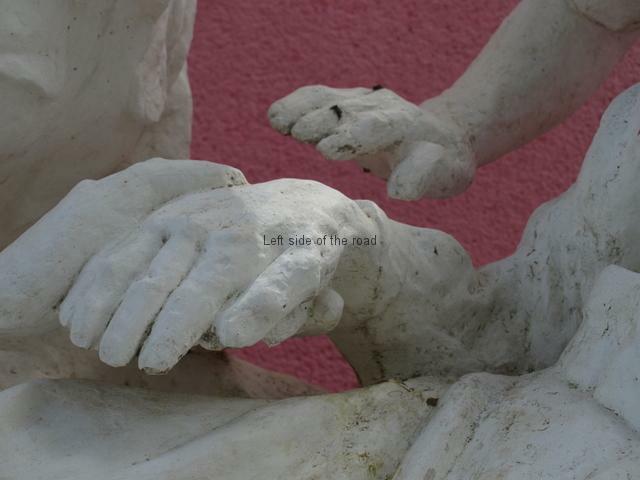 Also the right hand of the male partisan hovers over the hands of the dead, or dying soldier, and the female fighter. This seems to be him about to say that there’s no point in checking his pulse, it’s already too late. There’s a very tranquil feeling emanating from this scenario. It’s a sad picture. As hard as they try they can achieve nothing. Death is final. Something precious has been lost. But this is a pessimistic approach to death in war, the capitalist approach. This is the impression we get from the memorials that abound throughout Europe to those who died in the war of 1914-1919 – those who died in previous conflicts seemingly not worthy of remembrance in such a widespread manner. Capitalism convinces workers to fight and possibly die for reasons that don’t benefit those same workers. This has been the case since capitalism became the dominant political and economic system a few centuries ago – the war against Fascism between 1939 and 1945 being, conceivably, the only exception. However, capitalism cannot celebrate the deaths that are a consequence of their predatory wars. It’s best if these deaths are mourned, quietly. There are annual services of remembrance but these always separate the actual deaths from the reason why they were placed in such a situation in the first place. To celebrate those deaths might make people wonder what they actually got out of the war. To celebrate the defeat of Fascism might make people think that instead of fighting against something they should fight for something, a change in the system, a new tomorrow. On the other hand the impression from the overwhelming majority of Albanian lapidars, and socialist realist art in general, is one of defiance, displaying a positive, optimistic, forward-looking and triumphant approach. They celebrate the deaths in the National Liberation War as those men and women fought for a future, for a new society. In Volume 1 of the Albanian Lapidar Survey report there’s an article by a psuedo-academic called Gëzim Qëndro. In this article he attacks and attempts to denigrate ALL the production of Socialist Realist art (or at least ‘monumental propaganda’) as being the victory of Christian thinking over a proclaimed atheist state. In this article he displays a total lack of understanding of Albanian history, is unable to see any aspect of development in public sculpture from the 1960s onwards and certainly has no understanding of the aims of the country’s Cultural Revolution. This makes the last sentence in Qëndro’s article, ‘ … the monument Shokët is a clear testimony of the presence of the religious connotations in the atheist art of Albanian socialist realism,’ a totally erroneous and ignorant reading and understanding of Albanian lapidars, their reasons for existence and the story they are attempting to convey. Like so many bad academics Qëndro chooses his thesis and then looks for ‘facts’ to back it up, relying on most people’s lack of desire or ability to check matters for themselves. Behind the sculpture there’s a concrete panel to which is attached a monolith (lapidar) that is positioned so that it rises exactly from the middle of the group of three. At my visit the panel was a somewhat sickly pinkish colour and the lapidar yellow. On the right hand side of the panel are the words ‘Lavdi Deshmoreve’, meaning ‘Glory to the Martyrs’. The only other marking on this panel are the dates 1939 and 1945. This is slightly confusing. On WWII monuments throughout Europe the end date is normally the one where the war was considered to have ended in that particular country. I’ve always worked on the basis that in Albania that was the end of November 1944 so the year 1945 being on this monument is a mystery to me. It has nothing to do with treaties (the reason why some memorials for WWI in the UK show the date 1919 as the end of the conflict) as Albania was not invited to conferences where the likes of reparations were discussed and decided upon. The sculpture has been ‘cared’ for over the years. Unfortunately this seems to be the sort of care that has more good intentions than actual skill in preservation. Whitewashing of the plaster is gradually causing some of the detail to be lost. However, considering it is now just over 50 years old the statue still allows the viewer to get an understanding of Paskali’s intentions. As is the case with most of the Martyrs’ Cemeteries a small building was dedicated as a museum of the area, any battles that might have taken place in the vicinity and also a remembrance of the local people who died in the war. The one in Permet seems to be still acting as such (many are either totally abandoned or empty shells of what they used to be). Unfortunately on my visit there was no one around and it was all locked up but there were some busts and pictures still on display. To the left of the door of the museum is a rectangular, marble plaque. This doesn’t list the names of the those buried in the cemetery but makes reference to those from the Permet region who are commemorated in the National Martyrs’ Cemetery in Tirana. 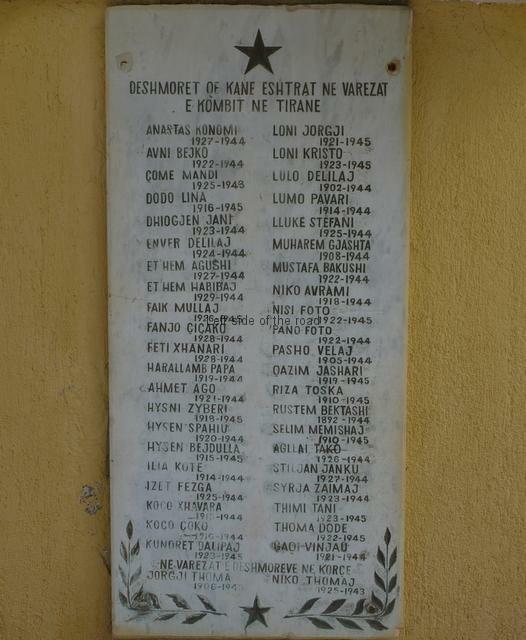 The words at the top of the plaque – ‘Dëshmorët që kanë eshtrat në varezat e kombit në Tiranë’ translates as ‘Martyrs whose remains are in the National Cemetery in Tirana’. This is something I have not seen elsewhere. From the main square in the centre of Permet head down towards the bridge over the river. Once on the other side walk straight ahead, in the direction of Tepelene, and the cemetery is about 200m on the right, a short avenue of pine trees lining the path to the cemetery gates. 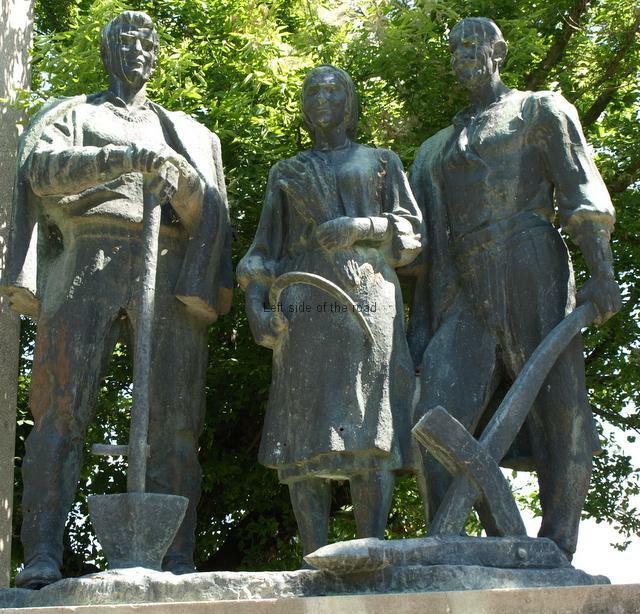 This entry was posted in Albania, History, Monuments and Memorials, Socialist Realism, Travel and tagged albanian lapidar survey, als 244, comrades, martyrs' cemetery, odhise paskali, permet, shoket by Michael. Bookmark the permalink.